Finns is an Irish pub that has 30 beers on draft, 13 Irish whiskeys on tap, nightly drink specials, and food. It’s an ideal place to grab a quick drink with friends and enjoy a game of shuffleboard, darts, or pool. They also have tv’s that allow you to watch your favorite sporting games. 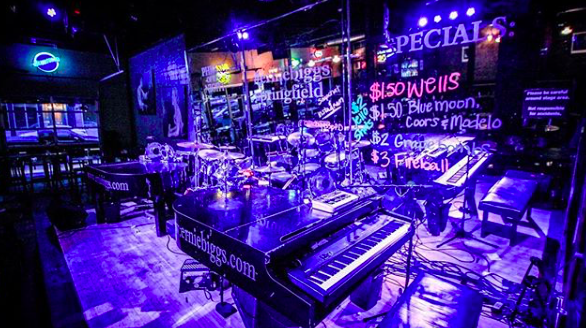 Ernie Biggs is a Chicago style dueling piano bar that plays a mix of pop, rock, and hip hop. It is very lively but allows you to sit down and chill. Wednesday is College Night and has free cover before 10pm with a student ID. Thursday is Karaoke Night with free cover all night and Friday is Ladies Night with free cover for ladies. There are plenty of drink specials all weekend! Zan is owned by the same people as Boogie and is similar in a lot of ways except is has a larger dance floor where dancing is more encouraged. They allow minors all week unlike Boogie and has two levels that allows you to sit in a booth or dance the night away. Club Rodeo is a country style nightclub that plays a mix of country, pop, and hip hop. It includes a large dance floor, ample seating, and a large outdoor patio. Dancing is highly encouraged and there are many line dances that go on through the night that cause people to run to the dance floor. Club Rodeo’s specials include Wayback Wednesday where cover is $1 for ladies and $2 for guys. Thirsty Thursdays has no cover before 9pm and many drink specials through the night; Friday is College Night where 21+ is free with a college ID and 18-20 is ½ price. Saturday is free cover until 8pm with drinks specials through the night. Vintage is a Vegas style nightclub with neon lights illuminating the dance floor, a VIP area, and a DJ. Bottle service is also available. Thursday, College Night, is free cover 9pm-10pm for ages 18-20 and free until 11pm for those who are 21+. There is free cover on Fridays for everyone and Ladies Night on Saturdays with free cover for ladies 21+. There are drink specials all weekend long.